Graduates, senior officers and guests at the University's Retail Marketing graduation at the Singapore Institute of Management. Photos: David Wirawan. 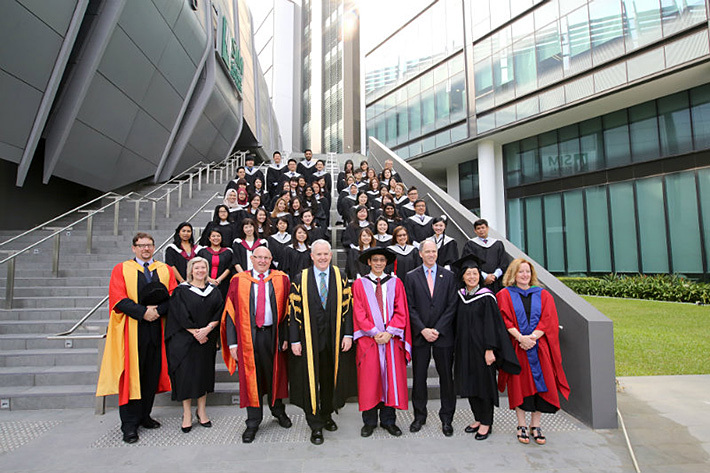 Graduates from the University of Stirling’s Singapore Retailing degrees celebrated their successes at the Singapore Institute of Management Global Education (SIM GE). Professor Gerry McCormac, Principal and Vice-Chancellor of the University of Stirling conferred degrees upon more than 50 graduates of the highly popular BA Hons in Retail Marketing. The course is supported by the Singaporean Government’s Workforce Development Agency and taught at SIM GE by lecturers from Stirling Management School’s Institute of Retail Studies. Three graduates also completed the MBA in Retailing, a two-year distance learning course in partnership with the Retail Academy of Singapore. The British High Commissioner was Guest of Honour at the ceremony, where businesswoman and entrepreneur Dato' Dr Jannie Chan received an honorary doctorate. Dr Chan founded specialist watch retailer The Hour Glass, which has boutiques across the Asia Pacific region. She has dedicated much of her time to working with organisations for women and is the first and only woman executive board member of the Commonwealth Business Council. The partnership in Singapore has been further extended with the launch of a new joint honours degree in Sports Studies and Marketing and it is anticipated further degree programmes in partnership with SIM GE will be launched in 2016. Students and graduates will be bolstered by Stirling’s excellent job credentials, ranked second in Scotland and seventh in the UK for employability, with 96 percent of its graduates in employment or further study within six months of completing their degrees. Professor Gerry McCormac, Principal and Vice-Chancellor of the University of Stirling, said: "Congratulations to all our Retail graduates on their achievements and I wish them every success in the future as they help to shape a hugely important sector, one upon which whole economies are built. Our partnership with the Singapore Institute of Management Global Education continues to go from strength to strength and is a key part of Stirling’s global outlook. "Our students and staff come from across the globe – creating a rich and diverse learning environment; our researchers work with partners worldwide to solve global challenges and our graduates are making a difference around the world – in business, industry, healthcare, education, sciences and the arts." Dr Lee Kwok Cheong, Chief Executive Officer, Singapore Institute of Management Global Education, said: "The retail sector is fast evolving with the advent of online shopping, changes in consumers’ purchasing behaviour and service-level expectations. All these developments necessitate a new breed of professionals who would have the skills set to tackle existing as well as upcoming challenges. The University of Stirling’s strong industry links and our Singapore Institute of Management Global Education brand of holistic education have laid a solid foundation for our graduates’ retail journey ahead."